What a weekend! I get so excited each month to host Dallas Blogger Brunch and this month was such a treat; Lazy Dog Restaurant in Addison hosted this month's brunch and we had a great time tasting their newest brunch menu items! Each month, I partner with a local Dallas restaurant to host brunch for 12 bloggers to build relationships within the blogging community and to enjoy everyone's favorite meal; this month, I also had the pleasure of working with Lauryn from Love Nest Creative, who provided our beautiful place cards. 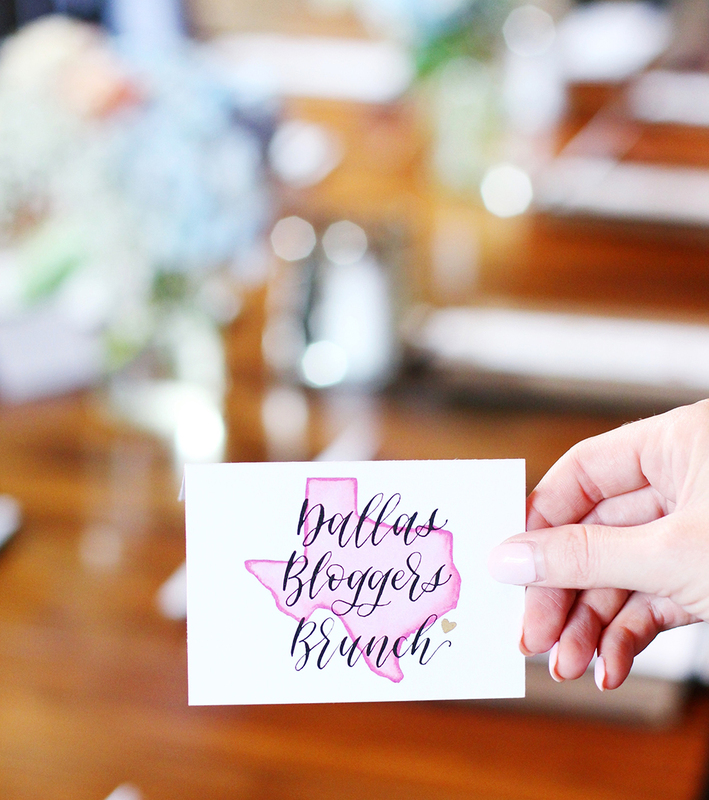 You can see all of our past brunch events, request an invitation, or ask questions about hosting or donating your services on the Dallas Blogger Brunch page. I was fortunate to visit Lazy Dog prior to this brunch and try a few of their brunch menu items, so I knew it would be a tasty brunch. I usually go for the sweet menu items, so I tried the Baked Berry Pancake and the Chicken + Biscuit (above); this visit I tried the Strawberry French Toast with fresh whipped cream (below) and it was brunch perfection! I love seeing what all of the girls order and sampling a bite from some of their plates, just to make sure I'm not missing anything! The Lazy Dog menu has both sweet and savory items, like the Chilaquiles (below), so everyone will be satisfied! The Addison Lazy Dog location was SO nice because we didn't have to valet our cars (all the Dallasites said "hooray!") and the restaurant porch is dog-friendly, complete with a doggy menu! If you haven't tried Lazy Dog's brunch, I think you will enjoy the variety of menu items and the casual rustic atmosphere, so definitely give it a try soon! As always, it was such a fun event and each of the girls who attended were a pleasure to get to know! Follow along on Instagram for weekly brunch recommendations! Thank you to Lazy Dog and Love Nest Creative for partnering with Dallas Blogger Brunch!